But don't expect to be winning any extravagant prizes this time. Over 30 years after its original release, Atari has decided to resurrect one of its most beloved game franchises: Swordquest. Released in 1982, this ambitious gaming series was a pretty unique proposition at the time. As well as offering $150,000 worth of prizes to players who could solve all the puzzles in the game series, Atari also teamed up with DC to release a companion comic alongside each game. Now, thanks to Dynamite Entertainment, the long dormant franchise is getting a brand new run of comic books starting this May. Swordquest was not only one of gaming's first titles to combine fast paced action with the logic and puzzle-solving of adventure games, but also one of the few to offer substantial real-world prizes. Unfortunately, thanks to Atari's financial problems, the fourth game in the series was never released, leaving gamers with unsolved puzzles and an unfinished tale. The upcoming comic series uses this real-world tale as its inspiration, telling the story of Swordquest super-fan Peter Case. With the last game in the series never seeing the light of day, it crushed the comic's protagonist, but after having to move back in with his mother, Peter rediscovers all his old Atari stuff - but with a fantastical twist. The series will be co-written by Chad Bowers and Chris Sims, writers of both Marvel's recent nostalgic X-Men '92 series. The artwork comes from Batman '66 artist Scott Kowalchuck, as well as featuring a special pencilled cover variant drawn by the artist of the original DC series, George Perez. 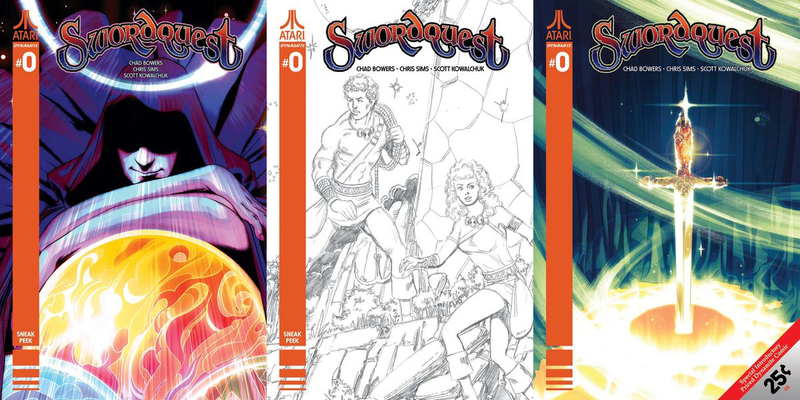 Dynamite Entertainment's first issue of Swordquest is out this May, featuring four variant covers and costing just 25 cents.